May I warmly welcome you to the China Forum. I am very pleased to attend the Conservative Party Conference. I congratulate your Party on your return to power after 13 years. The UK was the birthplace of political parties, with the Tory Party being the first. So, I think it is fair to say that if you know the history of the Conservative Party, you know the history of modern Britain. I am glad to have this opportunity to learn more about your party. I also hope that you will get a better understanding about China through today's event. The Conservative Party has made three historic contributions to China-UK relations. In the 1950s, during Sir Winston Churchill's administration, Britain established relations with the People's Republic at the chargé level. Then in the 1970s Prime Minister Sir Edward Heath established full diplomatic relations at the ambassadorial level with China. Finally in the 1980s when Lady Thatcher was Prime Minister, the two countries signed the joint declaration on Hong Kong, removing a major obstacle to China-UK relations. Now with the Conservative Party back in government, we do hope that it will make new contributions to our relations. And I would like to share with you my thoughts on how we can build a stronger China-UK partnership, which is the theme of today's forum. I have summed up my thoughts in 3 As: Anticipation, Advantages & Actions. 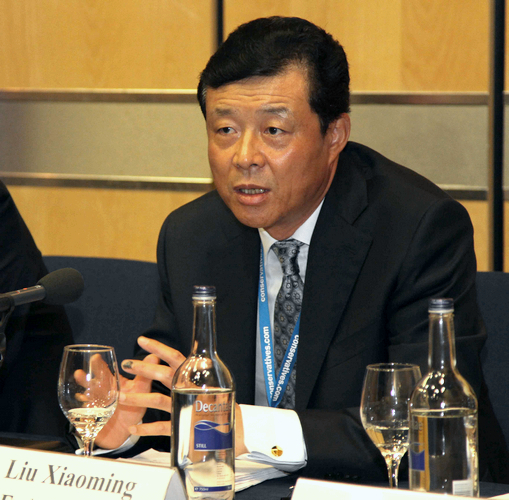 There is a shared anticipation between China and the UK for a closer relationship. The coalition government has made it clear that it seeks closer ties with China, when Prime Minister Cameron expressed his desire to further China-UK relationship, during his recent meetings and phone calls with Chinese leaders. Foreign Secretary Hague also proposed the "partnership for growth" during his July visit to China. It is clear that the UK is also keen to expand exports to China, whilst bringing in more Chinese investors, students and tourists, in support of a sustainable global recovery. For China, the UK has always been an important partner. We want to enhance mutual trust and expand cooperation across trade, education and culture, as well as strengthening ties with the UK on international affairs. 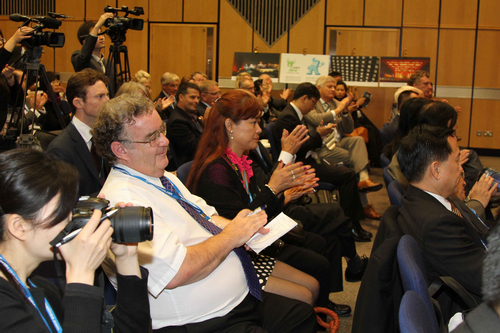 This will not only promote our relationship, but will also benefit the interests of the people around the world. There are many advantages for the growth of the China-UK relationship. Firstly, we have no fundamental conflict of interests politically. The "one country, two systems" has been functioning smoothly in Hong Kong since its return to China 13 years ago. And the UK government adjusted its century-old policy on Tibet by recognising it as part of China. These two long-time obstacles to China-UK relations are now a thing of the past. Secondly, we already have effective mechanisms for dialogue, in the annual Prime Ministers' visits, the Economic and Financial and the Strategic Dialogues. We also have consultation groups across a wide range of areas including trade, technology, education and human rights. These arrangements have allowed us to fully explore possibilities for cooperation and narrow our differences. Thirdly, we have much to offer each other economically. The UK is a major developed country. China is the largest developing country. But despite the tremendous progress it has made, China's per capita GDP remains low, at only one tenth of that of the UK. With 150 million people in China still living in poverty and the challenges of unbalanced economic development across our industrialised and rural landscape, we still have a long way to go. Given our different stages of development, our two economies each have unique strengths. China is highly competitive in manufacturing, whilst the UK leads the world in financial services, high-end manufacturing and the creative industries. This has opened up enormous prospects for our future cooperation. Fourthly, our cooperation in education, culture and other fields is thriving. With over 100 thousand Chinese students now in the UK, and more than 3 thousand British students are studying back in China. Over 400 million people are learning English in China, and many of them have developed a keen interest in British culture and visited the UK. Last year, 125 thousand Chinese tourists visited the UK. This year, the Shanghai World Expo has provided another exciting stage for exchanges and cooperation between our two countries. The UK national pavilion, with designs and creativity unique to Britain, has won the hearts and minds of many Chinese visitors and the Chinese media. Politically, we should strengthen mutual trust at governmental level. China and Britain are partners, not rivals. This is not only crucial to our cooperation, but is also a guarantee for sustainable growth of bilateral relations. And we have an unusual opportunity on hand to further cement our strategic partnership by ensuring the success of Prime Minster Cameron's first official visit to China next month. Economically, we should deepen our cooperation in trade and investment, identify priorities and promote flagship projects. We should assist exchanges between our small and medium-sized enterprises, and provide the information and services they need. We must also uphold the principle of free trade, reject protectionism and work for the early conclusion of the Doha Round negotiations. Culturally, we must also improve the understanding between our peoples. People-to-People and cultural exchanges should be further expanded, as we need to foster friendship amongst our young people. China hopes to see more British students studying in China and we will continue to support the Confucius Institutes and Classrooms in the UK. Internationally, we need to strengthen our cooperation and coordination. As two permanent members of the UN Security Council and countries of major influence, we share common interests and important responsibilities in upholding world peace. Working together, we can help resolve regional conflicts, advance multilateralism and safeguard the non-proliferation regime, as well as addressing climate change and promoting the reform of the international financial system. Lastly, we should engage each other through candid dialogue. Given our different social systems, levels of development and cultural traditions, it is only natural that our views differ on certain issues. But our common interests far outweigh our differences. As Sir Winston Churchill said, "Courage is what it takes to stand up and speak; courage is also what it takes to sit down and listen." We need the courage to listen and talk When differences occur. We need the wisdom even more to bridge our differences and widen our common understanding. I have been to this country for over seven months. And I still found the word "conservative" to be a bit difficult to grasp. When I looked it up in all of my dictionaries, even the recently launched Oxford English-Chinese Dictionary, I could still not find a satisfactory explanation. In this country, "conservative" doesn't mean upholding the status quo or opposing change. On the contrary, it represents the best of this country's traditions, discretion and a call for progress. Maybe the Conservative Party itself best embodies the meanings of the word. As we now stand at a new starting point in China-UK relations, I do hope that the Conservative Party will stay true to what "conservative" stands for and make a creative and bold effort for a friendly, cooperative and mutually beneficial China-UK relationship.